Ok, so hopefully you’ve just read Land Rover LT77 Oil Change and everything went well. So now its time to change the oil in your LT230 Transfer ‘box. Essentially, its the same process. First off, find and remove the fill plug. You’ll find it at the back of the transfer box where the transmission brake is. It will be right above the serial number. 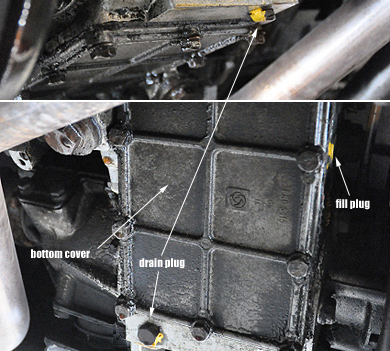 Next, is to find and remove the drain plug, which isn’t too far from the fill plug. Its located at the bottom of the gearbox at the lowest point. Have your funnel ready and give the oil a good amount of time to drain. It will drain slower than your main box fluid as its thicker. Once its drained, you are ready for refill but first you might want to put a new copper washer on the drain plug. When you’ve done that, refit it and its time to refill. When the transfer box is full, you can replace the filler bung. Its tapered so it will get tight before passing through the whole. Don’t over tighten it, you will want to get it out next time! Thats it! As simple as that. Unfortunately, most people don’t bother maintaining or changing gearbox fluids as much as they should. For the small amount of time it takes, it could really save you some cash in the long run. For more information on the LT230 click here: Land Rover LT230 Transfer ‘Box or click the blue ‘Contact’ button on the left for a quote.